Hospice nurses will be arranging their own family Christmases around their shifts throughout the festive season to ensure that as many patients as possible can spend their time at home with family and friends. Rennie Grove Hospice Care clinical nurse specialist Marina Hizirogullari said: “Working over Christmas is a special time. “For some of our patients and their families it can be a mixture of feelings, and they want to make it extra special. “If we can help by providing support and comfort, then we have contributed to that. “Unfortunately this time of year can also be a lonely time, so we try and have an awareness of patients who may be on their own over the long weekend, and make sure we keep in touch with them. “Our model of care is holistic, and supporting someone emotionally is equally as important as physical care. “My children will get their stockings and presents before my shift starts, and we have our family ‘Christmas Day’ a few days later when I am off duty. Rennie Grove Hospice at Home nurses work on a shift pattern to ensure that responsive, round-the-clock care is available to the hundreds of patients on their caseload at any one time. Being available to visit patients at home at any time of the day or night allows them to deal with symptoms and manage patients’ pain as soon as their condition deteriorates. This, combined with support and reassurance for the family whenever needed, can make the difference between a patient staying at home and having to be admitted to hospital. Sue Varvel, director of nursing and clinical services at Rennie Grove, added: “No-one wants to spend Christmas on a hospital ward if they can help it. “Sometimes it’s unavoidable but with the support of the local community we are privileged to be able to support the vast majority of our patients to spend Christmas in their own home. “Sadly, for some of our patients, this could be their last Christmas and so it is particularly poignant for all the family to share this special time together in an atmosphere of security and love. A comprehensive study has found that patients who die at home experience more peace than those dying in hospital and their relatives experience less grief. Pain relief was equally effective for both sets of patients, with patients dying at home experiencing no more pain than those who died in hospital. Rennie Grove Hospice Care enables 69% of its patients to die at home, compared with just 22% nationally. 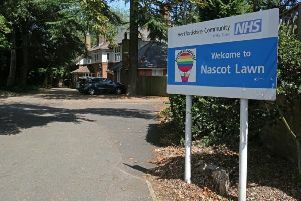 Currently around 15% of the cost of Rennie Grove’s services is funded by the NHS. To donate to Rennie Grove’s Christmas appeal, which aims to ensure more families have the chance to be at home together at Christmas, visit www.renniegrove.org/donate.